One of the hardest experiences in life is the death of a loved one. For centuries we have memorialized the remains of our loved ones with a cold and impersonal granite marker. We attempt to make them more personal with our dearly departed’s name, date of birth, date of demise and a heartfelt inscription. Today, technology is offering us a more personal approach at remembering those who have gone before us. Quick Response (QR) codes are being added to grave markers to give visitors the chance to see, hear and even experience the lives of the dead. Visitors to the cemetery are no longer limited to the cold and impersonal tombstone’s etched letters and numbers. The QR codes are being added to grave markers, when read by a smartphone QR reader, a website or multimedia collection created by the family is launched. This gives family members the ability to provide an interactive life story to anyone standing over the grave or logging in online. However, this new technology isn’t for everyone just yet, last month the cemetery advisory committee of Arlington National Cemetery discussed the use of QR codes on headstones at its quarterly meeting. 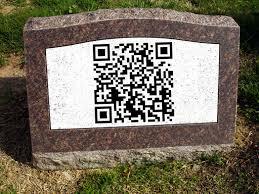 They decided to stick with the policy of not allowing QR codes at grave sites. “It’s something that’s worth discussing with the veteran’s community,” said Joe Davis, spokesman for the Veterans of Foreign Wars. “We like the idea of telling the story of the individual buried there. A story that’s untold is a story that’s lost forever.” Davis emphasized the importance of ensuring the stories are accurate, and finding contributors to write the stories before moving forward with such a plan. In a historical cemetery, QR codes could give visitors a greater understanding of the information and appreciation of those who are buried there. Students visiting the cemetery could receive a history lesson. Traditional headstones are very limited in the details about a person’s life story. QR codes on tombstones first drew significant attention in 2011 when Quiring Monuments, a Seattle-based company, began selling them in its search for innovation. “You’re growing or you’re dying. We always wanted to push the envelope and try new things,” says Jon Reece, the company’s general manager. Quiring Monuments chose QR codes after considering near-field chips, and realizing the technology wouldn’t work with most phones available at the time. Rob Jones, the Anchorage Memorial Park Cemetery director, expects to expand the use of QR codes in 2014 from traditional graves to his columbarium wall, a 600-foot long structure that can hold about 9,000 urns. Since the niches used for storing remains aren’t actually purchased from the park, the cemetery retains additional say over how the wall is decorated. The cemetery’s advisory board has given unanimous approval and Jones is waiting for approval from the municipal government so that he can allow expanded use of QR codes. Placing QR codes on grave markers is a technology that has its fair share of supporters and opponents, but whichever camp you belong to, one thing is true, this is just one of the many uses the future holds for QR codes.